At Middletown Honda, your Goshen-area Honda dealership, we’re happy to be able to offer the 2013 Honda Insight to Orange County and the surrounding area. 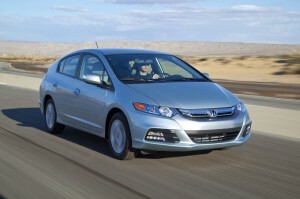 The Honda Insight led the charge of the super efficient hybrid vehicles when it came out so long ago in 1999. Now it’s still at the forefront of innovation and performance. This year, hybrids are becoming more and more ubiquitous. They’ve proven themselves to be dependable and efficient as they claim, so car manufacturers are embracing the idea, which means there’s a lot more competition out there. Let’s look at how the Insight compares to relative newcomer the 2013 Ford C-Max Hybrid. To start with, the Ford is more expensive than Honda’s latest hybrid. The lowest trim level of Ford’s model is still more expensive than the Insight EX with Navigation by nearly $3000, and more expensive than the base Insight by nearly $7,000. Honda also qualifies as a lower emissions vehicle, receiving the Super Ultra Low Emissions Vehicle II, while the Ford only received the Ultra Low Emissions Vehicle II Certification. As far as safety is concerned, both cars feature an array of airbags, but the Honda comes standard with active head restraints, while the Ford doesn’t. Electronic brake distribution is another safety feature that is standard on the Honda but not available in the Ford. In addition to shutting down the Ford in terms of savings and safety, the Insight features an EPA-estimated fuel economy of 44 mpg on the highway,* giving drivers exactly what they want in a hybrid: savings. It’s clear that if drivers want to save money and want a car that’s calibrated for safety, they should be driving the Honda Insight. Come visit Middletown Honda and test drive the fantastic 2013 Insight today! This hybrid is both fuel-efficient and affordable, so come down to our dealership near Goshen and have a chat with our sales team. They can work out what add-on features may benefit you and your car. While we encourage you to check out our excellent customer service firsthand, you should see what our customers have to say about their experience at Middletown Honda.